Many people believe that long and thick lashes are a universal symbol of beauty. Although these tiny hair strands seem like a small detail in our faces, they can have a dramatic impact on our overall appearance. Dr. John W. Bass, a plastic surgeon from Phoenix says, “Long lashes can make you look incredibly attractive in just a matter of minutes.” In addition, Dr. Michael Cunningham, a psychologist, who studies physical attractiveness at the University of Louisville, reports that large eyes with lush lashes signify youthfulness. Many people take this as a sign of good health, fertility, and femininity, and therefore make women with these features irresistibly attractive. Because of the perceived attractiveness of long eyelashes, many women and even men desire to have them. But unfortunately, not all of us are blessed to be born with natural long, thick eyelashes. This is also one of the reasons why many resort to using beauty products, such as mascara, fake lashes, and eyelash growth supplements, just to have good-looking eyelashes. According to mint.com, a typical woman spends approximately $15,000 on beauty products in her lifetime. Of that, almost $4,000 goes to mascara alone! Some women would even go the extra-mile in efforts to have fuller-lashed look, like undergoing certain enhancement procedures, such as eyelash extensions; and applying prescription medications, such as Latisse. The problem is while some of these products work with surprising results, they can also cause irritation, allergies, and other side effects. Mascaras, for instance, contain chemicals that can be drying to eyelashes, which cause them to become brittle and thin, resulting to more lost lashes in the end. In addition, while Latisse provides great results, these results are not permanent. If you stop using Latisse, your eyelashes will go back to their original state gradually. You have to continue using this product to maintain the effects, which is not practical for most people since the product costs a fortune. Each bottle costs approximately $120, which only lasts for a few weeks. If you’re afraid of using false lashes and other eyelash growth products, or you find them too expensive and inconvenient – or they simply really NOT your thing – then going the natural route can be your best option. Today, more and more women are switching to natural products to get their desired beauty. 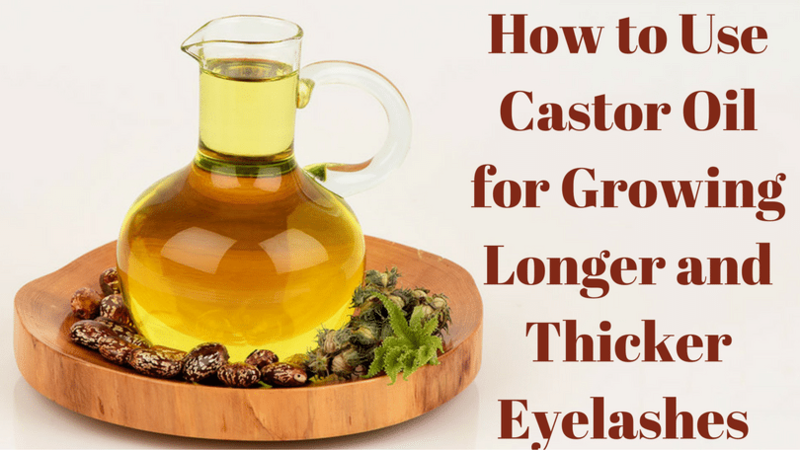 As for growing thicker, longer, and darker eyelashes, one of the best and natural solutions is castor oil. Castor oil is well-known for its many health benefits. But this wonderful oil is also a great natural remedy for moisturizing the skin and promoting hair and eyelash growth. This product can be bought in almost any grocery stores, mostly in the organic section. You can also purchase them online, with prices ranging from $6-$15 depending on the amount, quality, and where you buy them. Castor oil is the nature’s richest source of medium-chain fatty acids (MCFAs), a special type of fatty acid that has many beneficial properties, such as antioxidant, anti-inflammatory, and antibacterial properties. These fatty acids in castor oil are made up of about 50% lauric acid– the same substance found in breastmilk. Lauric acid easily binds with the natural protein found in hair, which protects them from breaking; and therefore, allowing your eyelashes to grow. Castor oil is also effective in helping prevent protein loss in hair, which is beneficial in the growth of eyelashes and reducing hair damage. And because of castor oil’s unique molecular structure, it easily penetrates to the hair shaft, which increases the speed of growth of eyelashes. Castor oil also contains antibacterial and antifungal properties, which are helpful for protecting your eyelashes against hair-damaging bacteria and fungi. In addition, it’s rich in vital nutrients, such as iron, Vitamins E and K, and other fatty acids, which are all beneficial for keeping your eyelashes longer and healthy. Lavender is an essential oil that has been found to help fight harmful free radicals and has shown to be effective in stimulating hair growth. Lemon, on the other hand, is a natural antibacterial agent that helps fight bacteria, reducing hair breakage; and thus, allowing hair to grow. Combine these two natural ingredients with castor oil, and you’ll have a powerful serum for growing your eyelashes. 1. In a 10ml roller bottle, pour the castor oil until it’s ¾ full. 2. Add 1 drop of lemon and 1 drop of lavender essential oil. 3. Place the roller on top of the opening, close it tightly using the cap, then shake it well. 4. Label your bottle, and voila, it’s ready to use! 1. After washing your face and removing your makeup, gently rub a little of the serum on your lash line (with the roller ball). 2. Rub it at least two times or until you see enough of the serum on your lash line. 3. Make sure that the tips of your eyelashes are coated well with the solution. 4. Blot off excess serum with clean, dry cloth or tissue. 5. Repeat this every night, preferably before going to bed. Castor oil is rich in omega-6 fatty acids, vitamins, and minerals that are crucial for maintaining healthy hair and promoting hair growth. Emu oil is packed with omega-3s and other essential fatty acids, which help prevent hair loss as well as promote hair growth. Plus, emu oil is non-comedogenic, which means it won’t clog your pores; therefore, allows your eyelashes to grow. Try the following recipe to make your lashes look naturally long and thick. 1. In a small dropper bottle, mix all the ingredients. 2. Place the cap on, then shake well. 3. Label your bottle, and voila, it’s ready to use! 1. After washing your face and removing your makeup, squeeze one drop of the solution on to your finger or on a cotton pad, then gently apply it on your lash line. 2. Make sure that the tips of your eyelashes are coated well. 3. Blot off excess serum with clean, dry cloth or tissue. 4. Use daily for best results. Wash your hands before and after using the castor oil serum. Make sure that your face is clean and free of makeup before you apply the solution. ​You only need to apply a small amount of the serum to your lash line. If there’s any excess, simply blot off with a clean, dry cloth or tissue. ​Skip any other eyelash product, such as mascara or false lashes, while using the castor oil serum. If you need to use mascara for a special occasion, ensure that you remove it fully before bedtime. Castor oil has natural moisturizing benefits, and is very good for hydrating your skin, so there’s no need to apply moisturizing eye creams before going to bed. ​For best results, use it daily, preferably at night before going to bed so your skin will have the time to fully absorb it. There are rarely any side effects reported with the use of castor oil. In fact, castor oil is known as a great alternative treatment, which even reduces the side effects of many other medications. However, allergic reactions may occur for individuals who are sensitive to castor. If you think you’re allergic to castor or want to know if you’re allergic to it, visit a certified dermatologist or doctor. Your doctor will run a series of tests to determine your castor allergies. Alternatively, you can also test by yourself to see if your skin reacts to it by simply rubbing a drop of the serum on a small area of your skin. Monitor your skin for next 24 hours to see if there’s any sign of itching or swelling. Castor oil has long been used in many parts of the world as a natural hair solution for growing and maintaining hair. Its unique fatty acid composition and nutrient content help in making your hair look beautiful and shiny. Research studies show that castor oil is effective in reducing protein loss and protecting the hair from damage caused by hygral fatigue. Castor oil acts as a natural moisturizer, which is believed to be effective in almost any type of skin. It is also well-known to have antioxidant properties, which makes it great for maintaining the skin’s youthfulness and stopping skin irritation. The essential fatty acid constituents of this wonderful oil, including lauric and capric acid, have antibacterial and antivirial benefits that help protect your skin from infection. The fatty acids (medium-chain triglycerides, or MCTs) present in castor oil are very easy for the body to absorb. Once the body absorbed them, they are directly transferred to your liver, where they are immediately converted as energy. Therefore, they have less opportunity to be stored as fats, resulting to weight loss. castor oil also helps stimulate your metabolism, helping you burn more energy, which leads to weight loss. Studies suggest that castor oil helps in reducing abdominal fats. Castor oil is easy to digest; therefore, putting less strain on your pancreas and digestive system. It is also known to have anti-inflammatory properties that provide soothing effect to your digestive tract. The MCTs in castor oil also have antifungal and antibacterial properties. These help kill the bad bacteria and fungi in body, which cause indigestion. castor oil is also rich in fiber and essential nutrients that help detoxify your body substantially. With its nutritional benefits and antimicrobial properties, castor oil is believed to be beneficial for overall health. castor oil may help improve blood sugar regulation, relieve stress, maintain healthy lipid levels, and prevent bone loss. Castor oil primarily comes in two forms: refined and unrefined. Refined castor oil is cheaper and usually tasteless and odorless. It’s produced from copra (dried castor) and undergoes various refining processes, such as deodorizing and bleaching. It’s also known as RBD castor Oil. Currently, the types of RBD castor Oil you can find in the market include expeller-pressed castor oil, hydrogenated castor oil, liquid castor oil, or simply castor oil. Unrefined castor oil, on the other hand, is tastier and it usually possesses a beautiful aroma of fresh castors. Unrefined castor oil is also known as “virgin” or “pure” castor oil. Unlike RBD castor oil, this oil is extracted from fresh castors, and it’s neither bleached nor refined. The methods of production include wet-milling or quick-drying. Since these processes don’t require any bleaching or additives, the oil retains its flavor and aroma. However, the quality still depends on the processing techniques and freshness of the castor used. Now, the question is, which of these two types of castor oil should you pick? Well, the answer is it depends on your personal preference, your budget, and how you intend to use it. If you’re going to use it for cooking, it’s best to choose refined castor oil since it has high smoking point of 400 °F. If you want the flavor and aroma of castor, then choose the one that is unrefined. As for nutritional value, virgin or unrefined castor oil contains more proteins and antioxidant. But this doesn’t mean that refined castor oil is “unhealthy”. RBD castor oil doesn’t have the same nutritional value as the unrefined version, but it’s also a great source of essential fatty acids. Again, the decision on what to choose is always up to you! Stop using mascara or other eye cosmetic products. If you need to wear mascara for special events, select the one with naturally-derived ingredients and make sure to completely remove it before going to bed. Wash your face before going to bed and ensure that all your makeup is removed. Makeup tends to block your pores, which prevents your hair follicle from breathing, leading to hair loss and stopping hair growth. ​Toss out old makeup as these products tend to collect bacteria if you keep them for too long. Keep your makeup and other eye cosmetic products no longer than 2-3 months. ​Brush your eyelashes at least twice daily using soft-bristled lash brush. This will effectively distribute the natural oil along your lashes and stimulate hair growth. However, you don’t want to brush them harshly as this can result to falling out. ​Gently massage your eyelids regularly to increase blood flow and stimulate eyelash growth. ​Practice healthy lifestyle. Make sure that you take enough protein, essential fatty acids, and vitamins as these nutrients stimulate hair growth, including your eyelashes. These include salmon, sardines, peanuts, egg yolks, blueberries, oranges, carrots, and pumpkins. Eyelashes are one of the most important features of our faces. They don’t just add beauty and dramatic expression to our eyes, but also help protect our eyes from dust, moisture, and other particles that can cause eye injuries and infection. It is also believed that the growth of your eyelashes reflects the overall health of your body. So if you have poor eyelashes, for instance, it may be a sign that you lack nutrients or suffering from a medical condition. Therefore, it’s crucial to maintain the healthy growth of your eyelashes. Fortunately, there are now many products available to achieve your desired long, thick lashes. But the problem is most of these products contain toxic chemicals that may be harmful than helpful. Also, most of these products require continuous application for them to work. If you stop using them, your eyelashes will return to their original state. With that said, you can always try alternative approach, such as castor oil. Unlike commercial products, natural ingredients are safe and don’t cause serious complications. They are wallet-friendly as well. Of course aside from using natural serum, it’s also important to live a healthy lifestyle. A lack of nutrients and essential vitamins can have a huge impact on the growth of your eyelashes. Make sure that you get enough amounts of vitamins, minerals, and essential fats to maintain your eyelash health.